The last few days have brought us all over Stellwagen Bank and Jeffrey’s Ledge! The whales have been moving around quite a bit, and it hasn’t been unusual to be watching whales many miles from the trip from the previous day. Yesterday we headed north to Jeffrey’s Ledge, and with the beautiful clear skies we could see into New Hampshire as well as Mount Agamenticus in Maine. 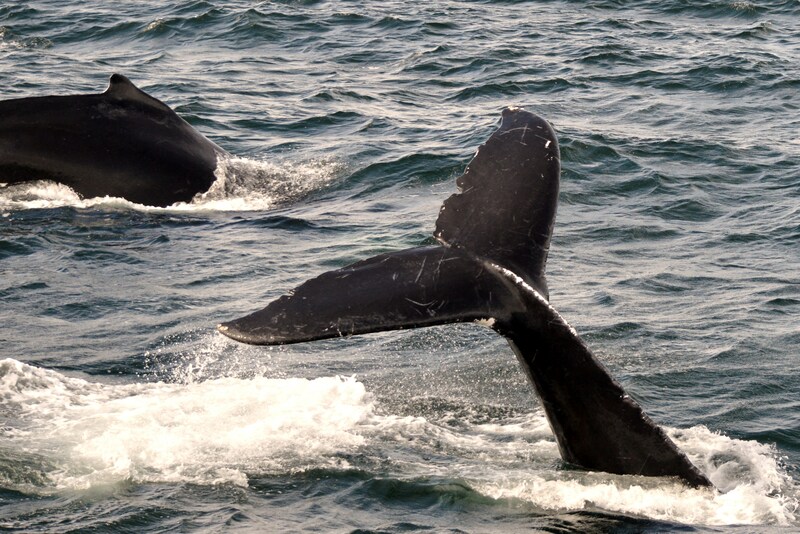 Two blows were spotted very close together, and we came across humpback whales Victim and Patches. In addition, a pod of Atlantic white sided dolphins were swimming around the two larger whales, and treated us to spectacular sightings. Atlantic white sided dolphins swimming alongside humpback whale Patches. Patches goes down for a deep dive, with Victim swimming nearby. 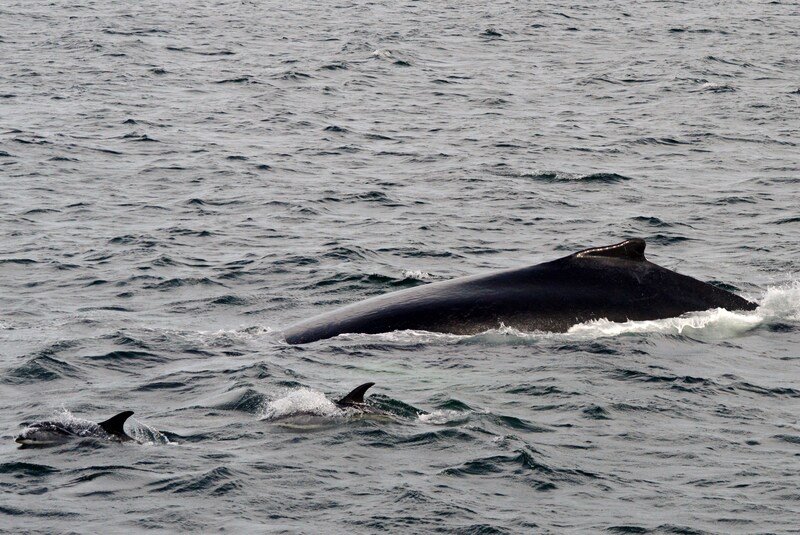 The two humpbacks surfaced very close to us for much of the trip, which is my favorite thing to see. They alternated sides and sometimes swimming underneath us from one side of the boat to the other. Just a fantastic day! 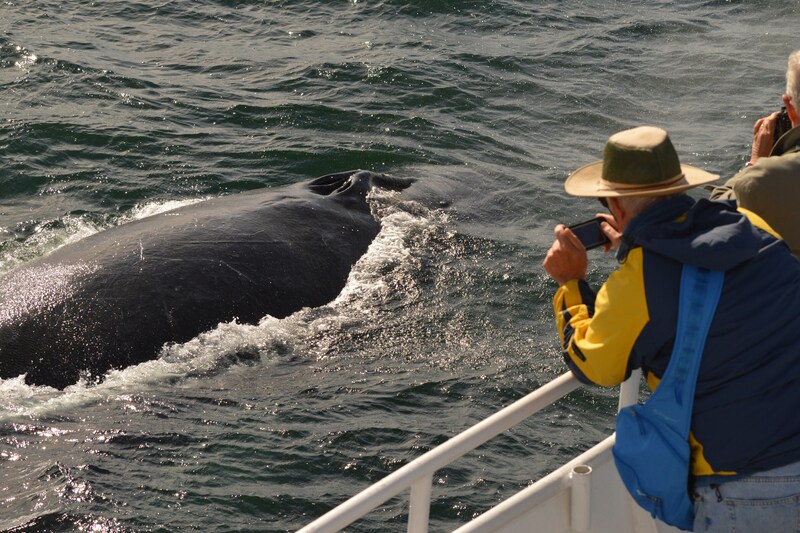 I have been on whale watches before, but this was the best by far! I have never seen the whales so close up to the boat and was surprised at how many times they surfaced right close to us. Amazing views!